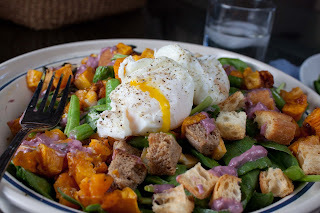 Fat and Happy Food Blog Tips and Techniques: You will not use the entire squash, nor all the dressing for this salad. Simply reserve the remaining for another use. Substitute gluten free croutons for a GF option. Preheat the oven to 400 degrees. Cut the outside rind off the squash and cut into 1 inch cubes. Line a baking sheet with foil, toss the squash cubes with the olive oil, chopped garlic and sage. Roast the squash until tender. Remove from the oven and add the green beans to the hot pan, the residual heat from the pan will soften the beans without overcooking them. Poach the eggs while the squash is cooking. Bring a saucepan of water to a simmer, add in the vinegar. Use a spoon to get the water rotating, creating a funnel in the middle. Pour one egg in the middle, the swirling water will help the egg to stay together. Remove the egg as soon as it is cooked, placing it on a paper towel. Swirl the water again and add the second egg, also placing on a paper towel when the egg is done. Depending on how cooked you want the yolk to be, this should take about 3-4 minutes. Assemble the salad. 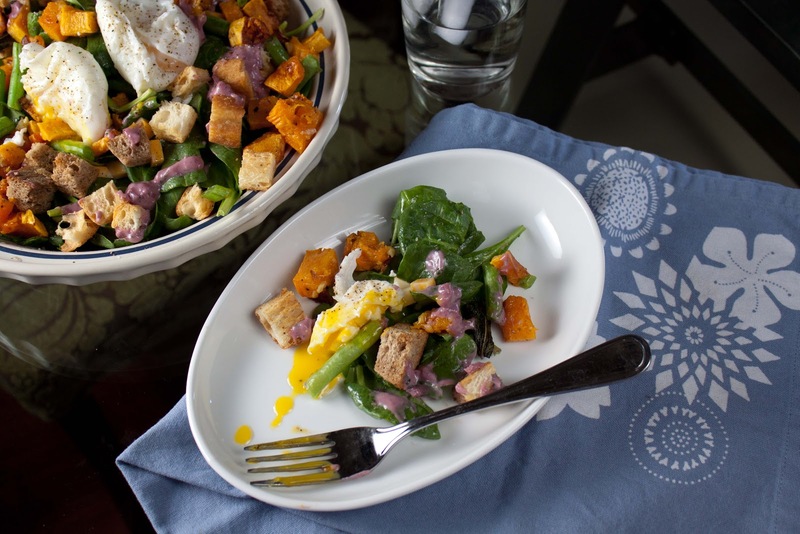 In a large bowl toss the spinach, cheese and croutons with a drizzle of olive oil and fresh cracked pepper. Add one cup of the warm, roasted squash and green beans. Drip two or three spoons of the blackberry dressing over the salad (be careful not to overdress it) and then top with the poached eggs. Serve immediately while the eggs and squash are still warm. If serving as a main course this plenty for two. Or use as a side for 4-6; just be sure to cut up the eggs and share the yolky-goodness. Saute the shallot and garlic cloves over medium heat in a drizzle olive oil for about 3 minutes. Turn off the heat then whisk in the jam, remaining olive oil, parsley and thyme. Let cool.